Summer means it’s Frozen Rosé season! 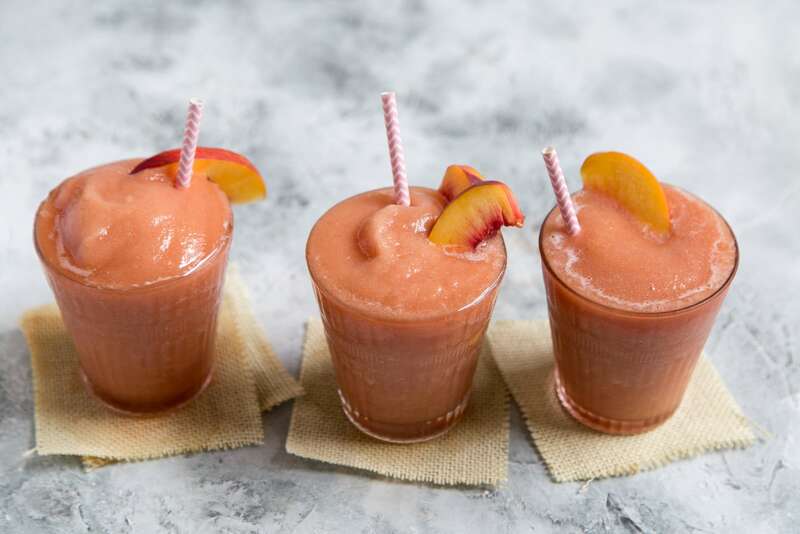 This Watermelon Peach Frosé is made with frozen seedless watermelon chunks, frozen peach slices, a touch of agave nectar, and an entire bottle of chilled rosé wine. The key to surviving summer is hydration. Ever since I bought myself one of these giant stainless steel water bottles, I’ve been drinking more water. I’ve noticed that my skin feels a lot better, I’m not as hungry as I usually am throughout the day, and my headaches have calmed down a bit. Moral of the story: DRINK WATER! I’ve also been eating my weight in watermelon. Watermelons are 92 percent water (and 6 percent sugar) and they’re a delicious way to stay cool and hydrated. Upon buying giant watermelons, I’ll slice them into chunks. Half gets thrown in the freezer and I happily devour the remaining half with chili salt. Can you guess what happens to the frozen watermelon chunks? They get blended into watermelon peach frosé! One point for you! Half a point if you answered: watermelon sorbet, watermelon margarita floats or watermelon tequila ice pops. 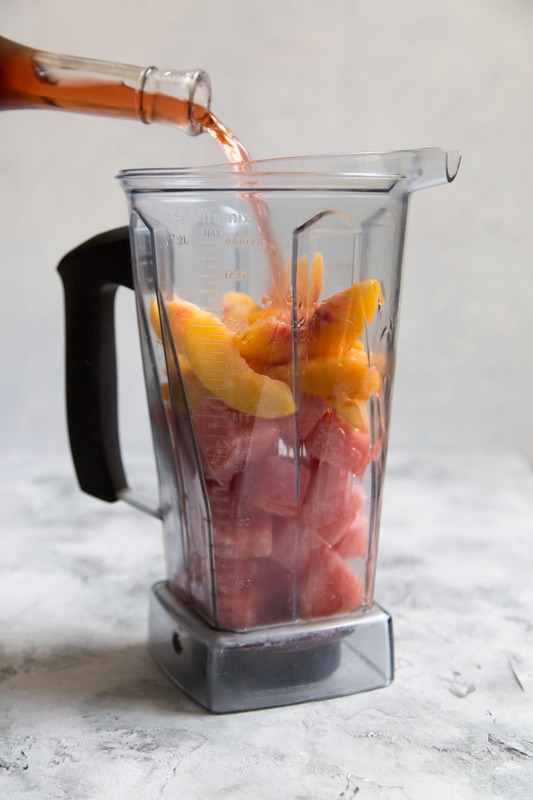 No fancy equipment needed, just a blender. However, if you have one of those slurpee machines (frozen daiquiri machines), can I come over and hang out? Add frozen seedless watermelon chunks, frozen peach slices, a touch of agave nectar, and an entire bottle of chilled rosé wine. Blend until smooth. And volià! You’ve got your own homemade slushie. 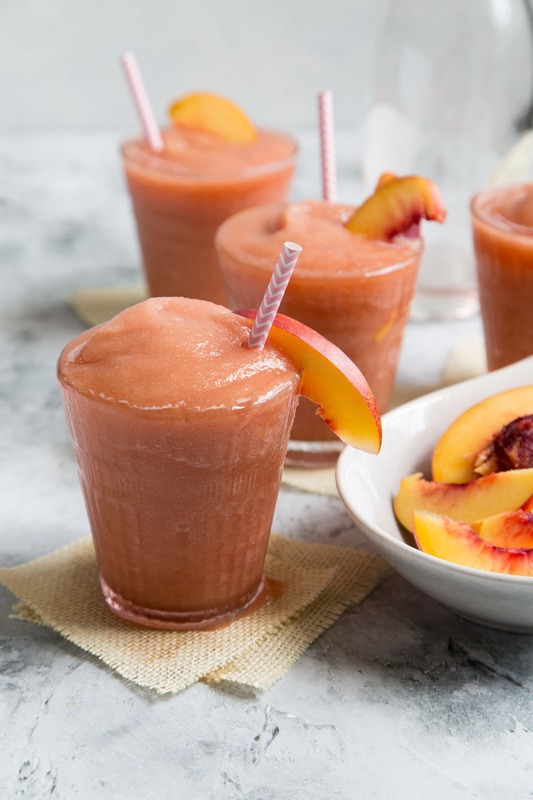 This watermelon peach frosé is what summer should taste like. It’s cold, refreshing, and just a tad sweet. I’m not fan of adding ice to blended drinks. The ice eventually melts and dilutes the drink. (Same reason why I don’t add ice to my smoothies.) By omitting ice and using frozen fruits, you’re adding texture and flavor. I used Sofia rosé. It’s a pinot noir based rosé wine that’s crisp yet dry. I suggest it for this recipe, otherwise use a darker, full bodied rosé. If you use a light or pale rosé, it’s flavors may get lost among the fruit. What have we learned today? The three steps for a great summer are: 1. drink plenty of water, 2.) eat all the watermelon, and 3.) enjoy a glass of watermelon peach frosé at least twice before September. CHEERS! 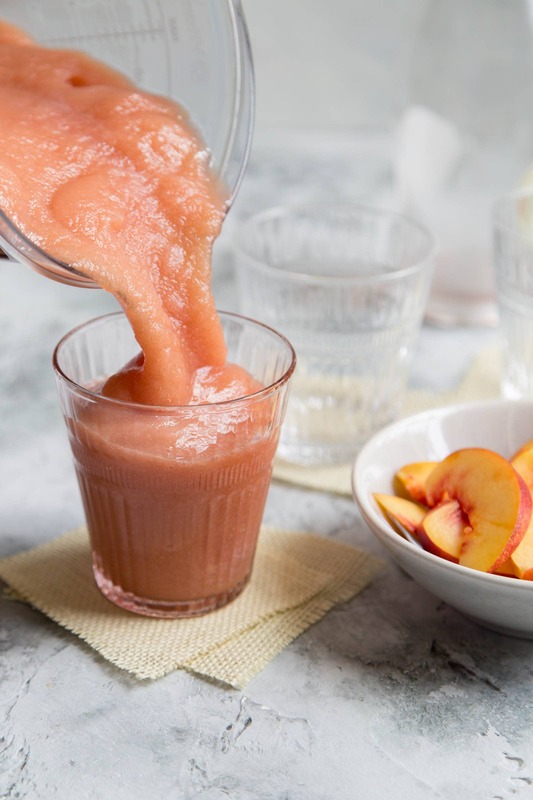 In a blender, combine watermelon, peach, rose wine, and agave nectar. Process on high until smooth. Pour into serving glasses. Garnish with fresh peach, nectarine, or watermelon slices. Enjoy immediately. Chilled wine and frozen fruits are necessary to achieve that thick, slushie like consistency. Omit the agave if your rose wine is on the sweet side. If you don't like agave nectar, you can also use honey, simple syrup, or straight up granulated sugar. This looks so tasty and is perfect for summer! I want to try this! This looks so tasty and refreshing, nice for those lazy summer days. Thank you for sharing. I am usually not a big fan of watermelon, but this drink looks amazing. I think that I am going to have to try it. My husband would love this. He loves watermelon drinks. 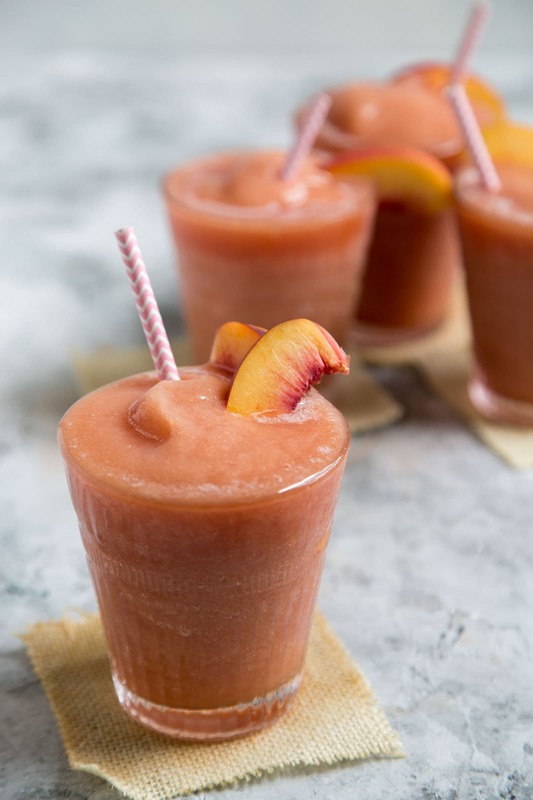 It is so darn hot here in California right now, and as soon as I saw your recipe for Watermelon Peach Frose, I knew I had to have one. I’ve just adjusted my weekend grocery list to include the ingredients for these wonderful, refreshing drinks! This has my name written all over it. So yummy and perfect for summer! This looks wonderful and so easy to make! Definitely perfect for a summer party or bbq (or a tuesday – haha!). Thank you! This sounds great! I’m going to have to try this one. Seems like a perfect summer drink! I can’t drink wine because of the heartburn, but I can drink rose. And I’ll have to try this. Off to look at your other watermelon recipes! Yes to pink drinks! 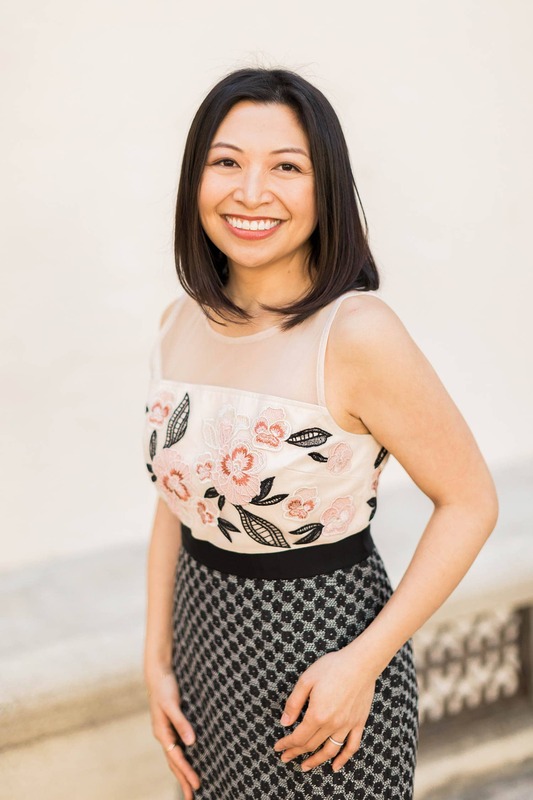 A dry rose is something I love to sip on with lunch. These little rose smoothies are perfect! I love working fresh fruit into whatever I can! Do you ever eat the frozen watermelon straight? I wonder if it would be like a popsicle since it’s so much water. Sounds delicious!